These are the initiatives that won the third call organized by Recon. 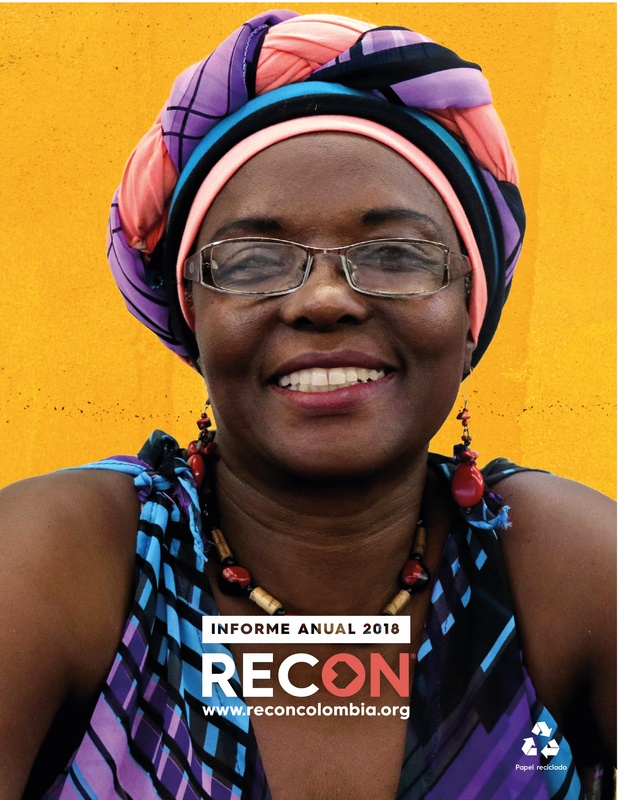 Recon, an organization that promotes social entrepreneurship, recently awarded the winners of the six categories in its third contest, supported by EL TIEMPO. There were more than 1,500 applications, and more than 800 met the requirements. After a preselection, 60 were exposed to the vote of the Colombians; then, a jury made the last choice among 18 finalists. At 24 she became one of the youngest Colombians to have a patent for creation in the health area, and today, 4 years later, she has just received the award for entrepreneurship and social innovation from Recon, in the technology category and communication, for Kit-Smile. Describing the project made is not easy. It looks like a car for children, but it is more than that: it is a tool that allows children with this disease to improve their quality of life through stimulation and constant exercise. In addition, those in charge of the minors receive training and psychosocial support from professionals. “I like it when they say it’s a ‘cart’ because that was my goal. Children say that it is their carriage, but in reality it is a product that seeks to integrate food, exercise and rest, “explains Leidy. Kit Smile allows children to do all three things in the same vehicle, without having to be moved by their caregivers from a wheelchair to a bed. Each ‘cart’ is designed according to the needs of the children and their medical condition. That is, it does not occur in a standard series. Once delivered, the United Foundation for Smiling – also led by the young designer – conducts training sessions for family members so they know how to use the product. Also, psychological support is given to eliminate the feeling of guilt around the disease, which occurs in mothers. The kit, besides being easy to fold and easy to transport, adapts to the growth of children and can be used between 2 and 12 years. It is estimated that there are currently 300,000 children with cerebral palsy throughout the country, and 70 percent of them are poor. Therefore, the objective is that the KitSmile reaches those disadvantaged children, mostly located in rural areas and without access to therapies or evaluations with specialists. Up to now, 57 kits have been delivered in rural areas of departments such as Meta, Casanare, Boyacá and Norte de Santander; and 228 people who are part of the family nuclei have been trained. 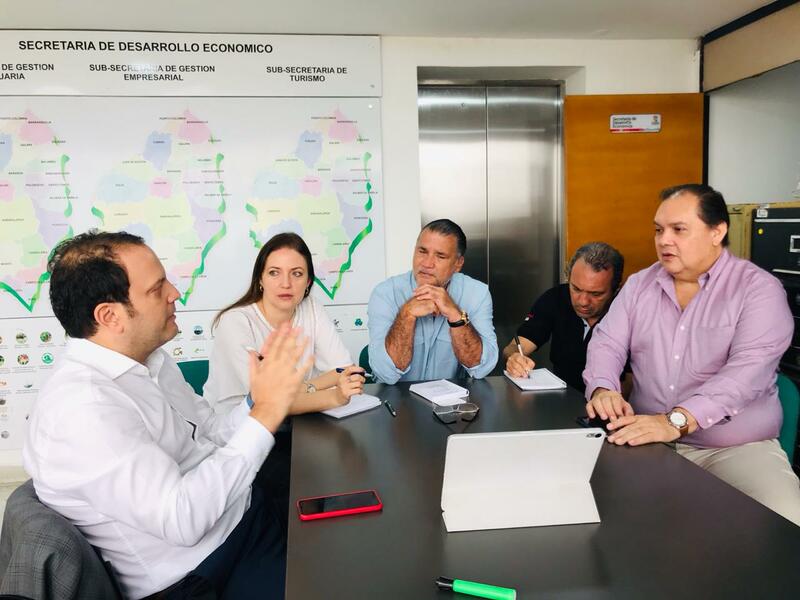 The support process also includes, thanks to an alliance with Avianca, a series of visits to Bogotá so that the children receive medical attention. Now, Leidy Cuesta seeks to take the project she initiated as her thesis to more places in the country. The goal is to reach Tumaco and Popayán in the short term, and get other foundations to join the initiative to change lives. Those who wish to apply to be one of the beneficiaries of a KitSmile can do so by recording a video in which they state their reasons and uploading it to www.kitsmile.com. One in four people suffer from water shortages in the world, according to a report by the United Nations (UN). 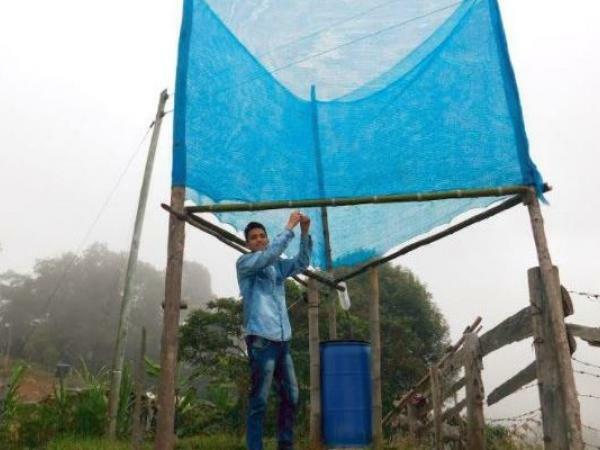 This reality was the one that caught the attention of Jhonny Umaña, a student of civil engineering at the Universidad La Gran Colombia who devised a 4 square meter fog sensor system that manages to collect 28 liters of drinking water per day. The name is Nebulón and he won the Recon contest in the environment category. 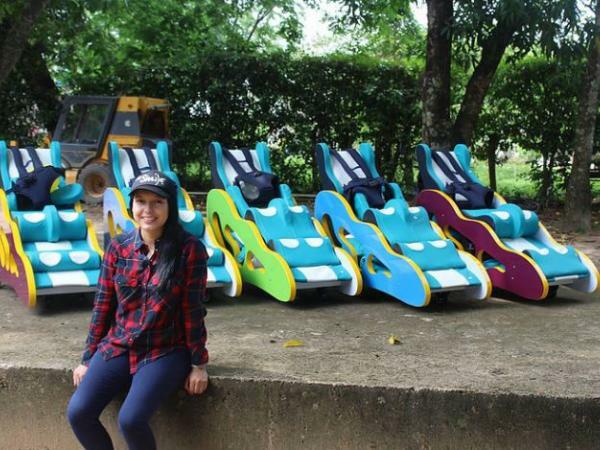 The project now has two prototypes in La Belleza, Santander, and in Chipaque, Cundinamarca. Jhonny spent whole nights researching the fogging systems that had already been done in Chile, Bolivia and Peru. “The method used in Nebulón consists of three mesh planes, in the shape of a triangle, so the capture of fog is done in several wind directions,” explains the 21- year-old. Each prototype can cost around $130, around 390,000 pesos. However, Jhonny -who had to shoulder the price of his resources- managed to create two and lower the construction costs using materials from the areas where they would be located. 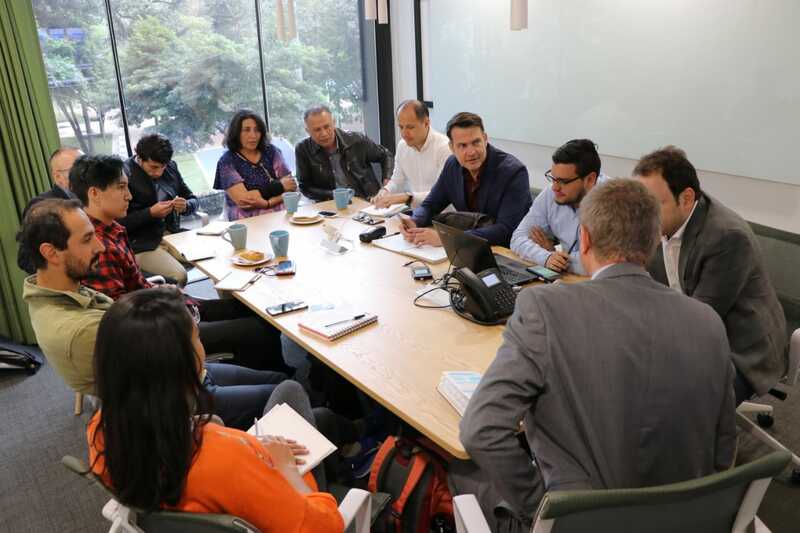 The Innovation and Talent Center of the Universidad La Gran Colombia helped to launch Nebulón. “There was an intention to attend calls like the Recon platform. Last year we were selected in another, in Nicaragua “, proudly says Jhonny. His idea is to reach places in Colombia with a deficit in water supply, such as the Caribbean coast. According to him, an investigation in the Atacama desert, in Chile, confirmed that the mist of the sea made the construction of the mist hunter feasible in low altitude regions. One of the challenges of Nebulón was to take the specimens to the sidewalks where they were implanted. Jhonny is working on modular models that have an instruction manual for the farmers to assemble. Frutichar is a social initiative of El Charco, Nariño, which gives formal employment to young people between 15 and 26 years old with the aim of keeping them away from armed conflict. Its promoters, who won the Recon contest in the category of entrepreneurship and job creation, buy exotic fruits from the farmers and market their pulp. Its main plant is in the municipal capital, but its workers move around to find suppliers and sell their products. each one they gave us 3 million pesos. Then we created the initiative with 57 million pesos that helped us buy equipment and build the plant. How did you consolidate it? They (the Canadian embassy and the UNDP), since we started, asked us for two components: the productive and the social. In the social, the theme of leadership and political empowerment was introduced through workshops and activities. And already in the productive, we were 7 young people who wanted to work the fruit, but it did not reach us. Then another group of women joined, and there Frutichar emerges. The 19 had technical training with the Sena. Some deserted. Others were threatened and had to leave, and there we were 11. In addition, today more than 10 young people work in the plant to help us with the commercialization. According to what they sell, we get their payment. On average they sell 3,000 packages of pulps. Which fruits do you handle? We have 10 certified fruits with Invima registration. Some normal, such as mango, lulo, pineapple, which are grown in the region. But we also have some weird ones, like naidí and arazá. Now we want to introduce the ‘manoemic’, fruit that we are researching to give it a scientific name. What’s next for Frutichar? What are your dreams? 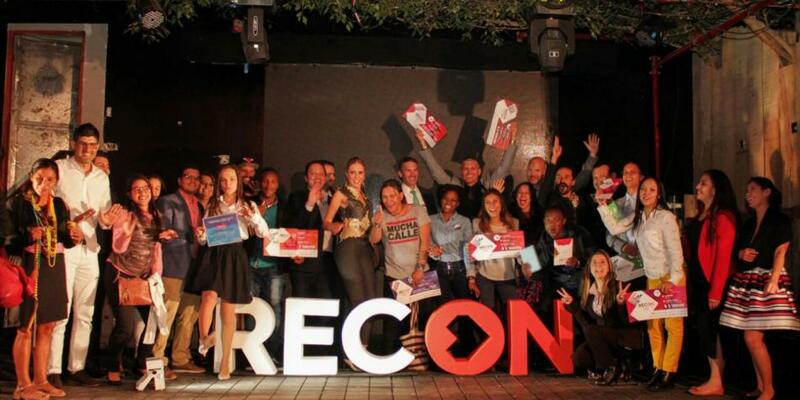 Now, with everything from Recon, the idea is to be able to reach other markets in the country. Most do not know our fruits because they are different flavors. We are doing marketing in Pasto and we have a very favorable environment. They have asked us to bring samples. We have thought about creating a non-profit association of producers. Once we have it, we will get training from the Sena so that we train the farmers, so that they have the technology and the project grows much more. His first concern upon arrival was the state of the school where he would be a teacher of religion and ethics. The infrastructure was deteriorating and was “not adequate for learning,” he says. As a result, he felt an enormous need to create a comfortable environment for children. He began to make murals on the walls of San Isidro; he needed students to imbue themselves with art because, according to him, there is no better activity than this to heal the soul. Three years later he was appointed art teacher, a great achievement for him because this position had never existed in the institution, because it was believed that to make art many economic resources were needed. “Art cannot be exclusive to those who have purchasing power. Peasant and poor children also have the right to be educated in this area, “he says. At 57, he remembers the difficulties he faced in this new position. Mainly because there were no materials or tools to develop the class and no resources to acquire them. 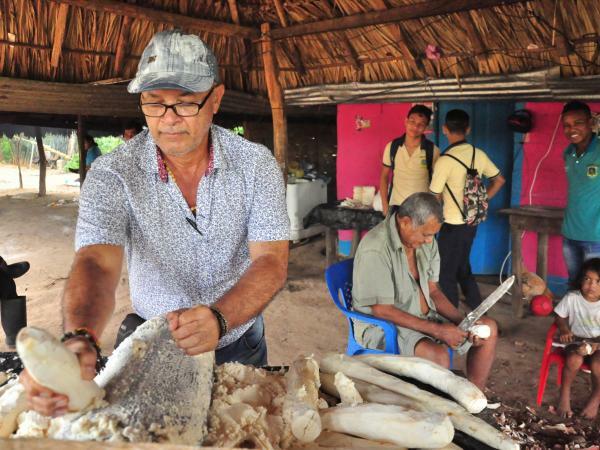 Before the need, Ildefonso was transported to the moment in which he was a child and his grandfather used the residues of casabe to glue beds, traditional throughout the Caribbean coast. He thought of the families of the children who study at the Educational Institution of San Isidro and live on the elaboration of cassava. In his inquiry, he realized that when they make this food, they only use the fiber from the yucca, the starch is discarded and they pour it into the streets, streams and path. These residues produce a strong odor and a great contamination. From the starch, Mestre managed to make a kind of vinyl, because the texture of this component becomes a type of white glue that when mixed with other elements, such as seeds and coal, acquires a special color. “For example, the spinach seed is mixed with water, then it is added to the starch and the color is purple,” explains the teacher. With his students he created some brushes with wood waste and tree trunks, and started his classes. Some time later he realized that he had created a great project. Ildefonso’s dream is to be a reference at the national level and to continue forming “not artists, but good human beings”. Casabe al Arte was the winner in the artistic, cultural and sports practices category. In the large territories of Cauca where nobody set foot due to the presence of armed groups or antipersonnel mines, a group of young people saw an opportunity for tourism. Luisa Fernanda Romero Muñoz, caucana, co-founder of Get Up and Go Colombia, took on that challenge. This electronic and telecommunications engineer, graduated from the University of Cauca, created along with other colleagues, in 2016, this corporation with the purpose of promoting tourism in the areas affected by the armed conflict, through activities such as Free Walking Tour, walks with which they intend to show the world that Cauca and Popayán are more than a war scenario. The objective of this organization, in which young bilinguals, members of the LGBTI community and victims of the armed conflict participate, is to change the image they have of Cauca in other regions of the country, due to the mark left by the armed conflict, towards a cultural and gastronomic destination for foreigners. 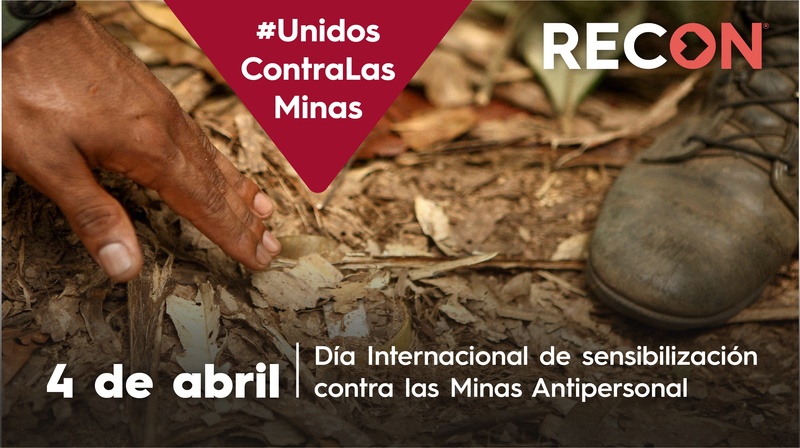 The project is supported by the Reintegration Route of the Agency for Reincorporation and Normalization (ARN). “Our idea with the ex-combatants is to make them see in tourism a second chance to write new stories, and that they can become the best guides in the country and be responsible for showing these hidden places to everyone,” says the young payanesa. This entrepreneur, with only 24 years of life, already has a career and also awards. In 2016, the Innovagen Foundation recognized her as a woman ambassador of the fight against cervical cancer in Cauca. She worked for the Colombian Southwest Corporation (Cesco) as coordinator of the Language Program. In 2017 she was part of Camp Eagle Hill, in New York, as general counsel. “This camp is aimed at children around the world, who come to this place to have a fun vacation. Diversity and inclusion are promoted a lot, and that is also what we apply here in the organization, ” she explains. This is not the first time that she participates in a high level contest. 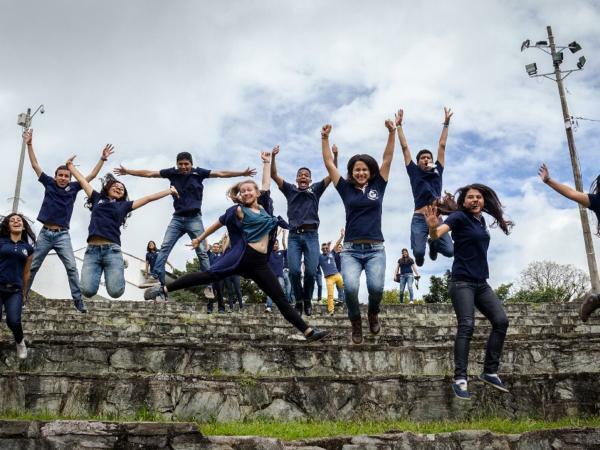 Last year, the US Embassy selected the 250 best initiatives for its Young Leaders of the Americas program (YLAI) and, among more than 3,000 Latin American postulates, the NGO Get Up and Go Colombia was selected as one of the best; 20 are chosen by Colombia and this is the only one in Cauca. They were taking courses in Modern Languages at Universidad del Valle when the brothers Adarley and Lilibeydy Manrique began to dream that children from the hillside of Siloé, in southwestern Cali, would enter a school with bilingual education, quality and low cost. Today, that dream, La Fontaine, is a reality. It all started when they managed to overcome the adversity in that hillside neighborhood, where they grew up with their other four brothers, and decided to be the first of the family to gain access to a university center. There they learned that love for children and teaching went hand in hand. “In the project of my brother’s degree we planned how to make the children of the 80,000 families who live in our neighborhood educate well and cut those gaps that permit only a few to study with quality. 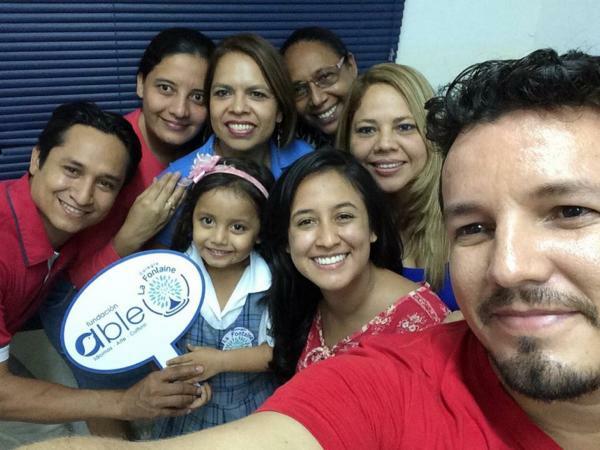 It was there, in 2013, when we started with the dream of the first bilingual school in Siloé, “says Lilibeydy. With the experience that both acquired working in private schools, they decided to join efforts with their respective partners to found the school in a rented house of 90 square meters. La Fontaine, for the moment, gives classes from first to fifth grade with an educational proposal that emphasizes bilingualism and the development of a skills program of the 21st century known as Steam, which unites science, technology, engineering, art and math. “The classes are personalized with pedagogical outputs, use of technology and all the characteristics of a quality school. All this educational offer allows our children to remain within the educational system, since the traditional education, added to the lack of support from the families, causes a high school desertion “. A tree that leaves the earth as a source is its logo, in which they specify that wisdom is connected with the pedagogical processes to bear good fruit. The four founders of La Fontaine have built their life project with a clean hand. “We broke with the inheritance of the family that did not reach the university. We want the same with children: to see that education is for everyone, that they can continue to dream of being what they want “.